The Rose of Sharon Church was formed on 14th July, 2004, as per the guidance of the Lord Jesus Christ. In view of the law of the country, the church is fully recognised as a registered church through Government registration. 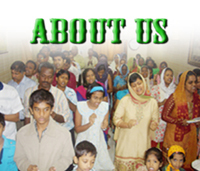 The church is shepherded by Pastor Saroja M., ordained by God and also according to the Christian Community. The church is an independant non-denominational church in Kalina, Santacruz, centrally located in Mumbai city. Another branch of the Rose of Sharon Church is functional at Mira Road, in the Western Suburbs of Mumbai. The members of the church are from different cultural backgrounds of India. Regular healing services are held according to the will of the Lord Jesus Christ every Saturday, 6:30 p.m. People from different castes, creed and classes attend these meetings and are touched by the love and power of God. The Lord’s specific promise for this place is,“Now My eyes will be open and My ears attentive to prayer made in this place.” (2 Chron 7:15) and also “How dreadful is this place! this is none other but the house of God, and this is the gate of heaven.” Genesis 28:17. As a result of which, many people receive healing from sicknesses, deliverance from the powers of darkness and answer to their prayers. People who have been blessed have given their written testimonies of the wondrous works God has done in their lives and in the life of their families. These testimonies are regularly filed and included in the monthly newsletter. Every Sunday, the church members and others who are hungry for the Word of God gather together in the worship service at the Rose of Sharon Church, Kalina at 09.00 a.m.. The congregation praises and worships God through music and songs. Powerful messages coming right from the throne of grace, is shared by the Lord’s servants. Every message is given by the direct revelation of God through Pastor Saroja. The Holy Spirit often prophesies through His chosen children. At the same time, Sunday School is attended by the children of the church members and also others who are interested in the word of the Lord Jesus Christ. Every Sunday evening 7:00 pm. there is a worship service conducted at the Rose of Sharon Church branch at Mira Road- Gaurav Residency, C-wing 403, 4th Floor, Near Mayor’s Bungalow, Mira Road (E),Thane Dist. 401 107. Many believers gather to praise God and hear the gospel. Every 2nd Sundays, the communion service is also conducted at both the churches. Fasting prayers are held every second Saturday of the month from 10:00 a.m. to 3:00 p.m. at Kalina, Church. People participate in prayers for various requests laid down on paper. Many are the testimonies of people who have experienced the wonder working power of the Lord Jesus Christ through these fasting and prayers. The Word of God is shared for the strengthening and edification of God’s children. Every third Saturday of the month at 5:00 p.m. Women’s fellowship is held at the Rose of Sharon Church, Kalina. Services are held at Chennai, Bangalore and Nasik. During the fasting prayers, oil is also prayed over by the servants of God (James 5:14) by the usage of which many receive healing and deliverance. Many have testified of the anointing of the Holy Spirit working through this blessed oil. There is a request book in which people write down their prayer requests for which fervent prayers are made by the servants of God. Phone calls of people in desperate need of prayer, are also attended by the servants of God in the church. As a result miraculous answers to prayers are experienced which glorifies the Lord Jesus Christ. Prayer meetings are held during weekdays in the houses of the church members and also in those houses, where the Lord specifically guides to have such meetings. These prayer meetings are held in different parts of Mumbai. The message of the living Christ is also spread through monthly newsletters throughout India and abroad. They contain inspiring messages, testimonies, children stories and the latest events at the Rose of Sharon Church. Everything in the Rose of Sharon Church is done strictly according to the Word of God, and by the perfect guidance of the Holy Spirit through his prophetess. Many families have tremendously been blessed, delivered and healed through the ministry and ended up being members of the Church. All this is only because the Lord Jesus Christ has established this Church. Even though our enemy, the devil, has tried countless methods to destroy this ministry and church, he has never succeeded; solely because the Lord Jesus himself is the foundation stone, the pillar and the power of this church.